Reliable color year after year. A gift for the next generation. Habitat, color & design possibilities. Fill your summer with blooms. Fresh flavor at your fingertips. Creative, colorful accents for your spring-to-fall show. Create a sanctuary for your feathered friends. The right tools make gardening a pleasure. We ship this item year-round. Birdbaths provide your feathered friends a place to drink, bathe and cool down, and you could get a cheap plastic one from a garden center for that. However, if you're carefully cultivating your garden design, that is by no means an elegant addition. 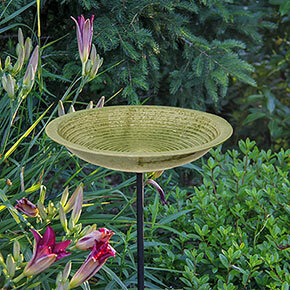 That's why we added this Versatile Ceramic Birdbath to our selection. It has the hand-thrown look of a garden sculpture—the glazed ceramic, celadon hued bowl is gorgeous—and when it's filled with water and visited by graceful songbirds, it adds an air of serenity to the landscape. 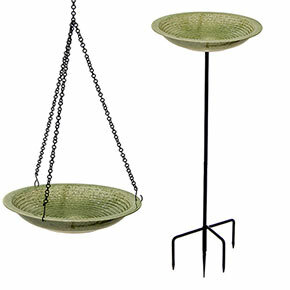 Generally, birdbaths come with either a hanging chain or a post, but we're sending you both options, so you can rearrange its position in your garden design as many times as you'd like. 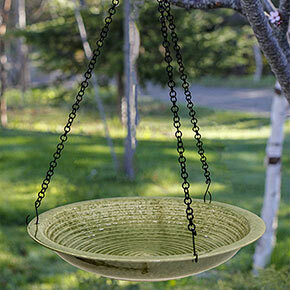 This sturdy birdbath is frost proof, but should be brought in during freezing weather to protect the ceramic bowl. Birdbath: 14" round, 3.25" deep. Post: 30" tall. Hanging chain: 20" long. Birding supplies, fertilizers and other general merchandise are typically shipped within 5 business days. If fertilizer is ordered with a plant order, you will receive your fertilizer when your plants arrive per the timeline outlined here. © Gardens Alive, Inc. d/b/a Spring Hill Nurseries. All Rights Reserved. Spring Hill Nurseries trademarks are registered trademarks of Gardens Alive, Inc.
Spring Hill respects your privacy. You can unsubscribe anytime.